Politics and backgrounds may try to divide us, but a traveler finds that regular people, put face to face, can enjoy common ground. The day started in Krakow’s Kazimierz neighborhood, with strong coffee and sweet tea in a rustic café called Mlynek. Because we were in a hurry, we grabbed a set of take-away pastries that we ate while walking from our flat’s neighborhood, past the Wawel, and into the heart of Old Town Krakow in Poland, where our guide for the day waited with half a dozen others. We thanked Ewa and walked over to the other day-trippers along the pedestrian square’s stone wall: a couple from London who were best friends and co-workers; a mother and adult daughter from Jordan; and Colin and Gwen from Scotland. “Where in Scotland are you from?” I asked. “Edinburgh,” Gwen answered. “It’s been a few years since we’ve had the opportunity to travel. We’re really quite enjoying Krakow. “We are too,” Alex said. Ewa looked at each of us in turn. “Shall we go?” Everyone agreed, and climbed onto the cozy van. 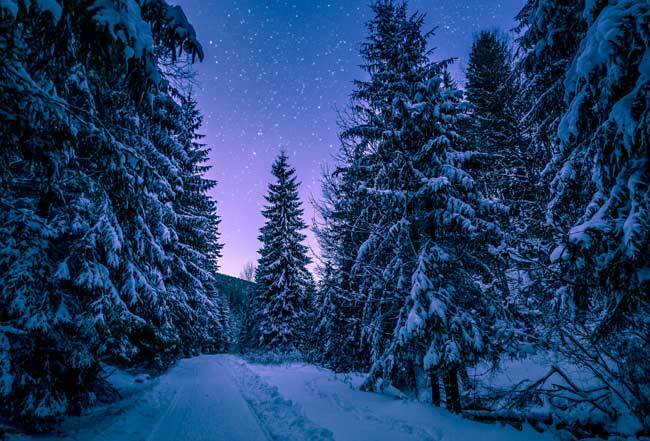 Poland’s winter capital — Zakopane — is 110 kilometers, or a few hours, from Krakow, making it a nice getaway from the bustling city. The drive or train ride itself is worth taking, providing great views of the Polish countryside, dotted with old wooden cottages and farms. Our group stopped at one of the colorful wooden homes, belonging to Jan Zieder, an artist whose father, Ewa explained, built the house he lives in, which also serves as his studio. 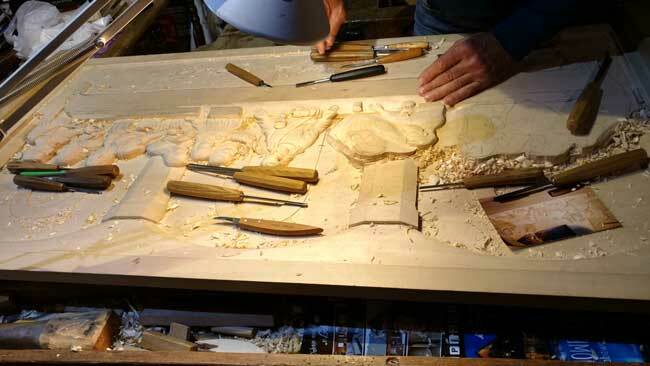 Jan sculpts everything from crucifixes and saint sculptures for churches to decorative furniture and souvenirs for private collections. We picked up a dozen eggs — hand-carved and painted wooden eggs. 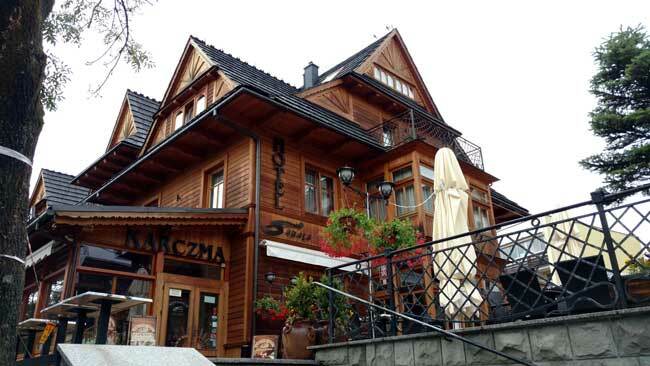 Zakopane was filled with the same types of alpine buildings of wood, complete with restaurants, hotels, and shops. 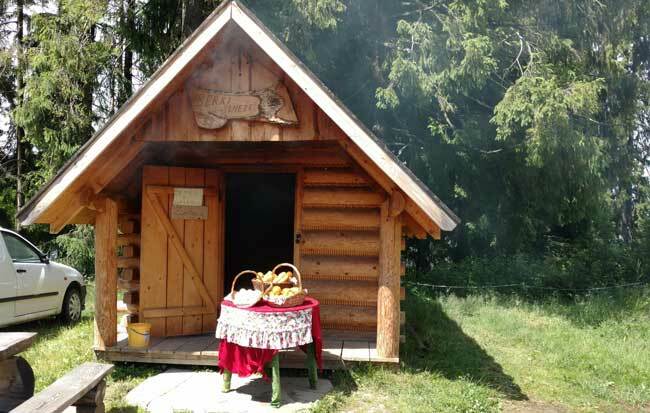 After a tour of the Villa Koilba Museum, highlighting the history of the local people with artifacts and pictures, we continued to climb up the shop and kiosk-lined walkway until we arrived at another wooden structure — the Polish answer to the log cabin — where Ewa turned to us. Local flavor was on the menu for me and Alex. The Scottish couple joined us as well. Alex went for the tried-and-true pierogi, these ones filled with cabbage instead of potatoes and meat. I enjoyed a meal of hearty cabbage, sausage, and boiled potatoes smothered with fresh dill. Instead of the usual cold beer, we opted for their hot, spiced beer. “It’s quite interesting,” Ewa encouraged. I sipped. The hot beer was laced with mulling spices: notable hints — no, bites — of clove, cinnamon, and nutmeg. “It reminds me of that hot spiced red wine served in Germany,” I said. “Or a cold Scottish Ale,” I offered. “Maybe you should just have a Hoop Cola,” Alex said, enjoying his own Polish answer to the Coke or Pepsi question. “I try not to,” I said. I’d almost considered buying the tee-shirt before this trip that read “I’m sorry about our president” in multiple languages, including Polish. “It does seem like the world is taking a swing for the worse,” I admitted. “Poland has already seen the worst.” Ewa sighed. “Like my professor.” Ewa ordered another round of drinks — we opted for cold ones this time — and proceed to tell us of hard times. “I graduated from Jagiellonian University, in Krakow. Perhaps you saw Collegium Maius, the oldest surviving building from the college that dates to the 1300s?” We all nodded, having toured the building in Krakow’s Old Town. “You know who else graduated from there?” Ewa asked. “Yes.” Ewa smiled at Alex. “Copernicus is an important alumnus. But to me, the most important person at that university was my favorite professor, who was still teaching there, on occasion, when he turned 100. When asked what the secret to long life was, he said, ‘don’t live an easy life.’ He did not. “That’s very impressive,” Colin said. “Well said.” Colin swallowed the last of his Polish beer. “Now, shall we Brexit — that is, exit — and meet up with the others?” It had been an hour, lost in Polish cuisine, drink, and political conversation. 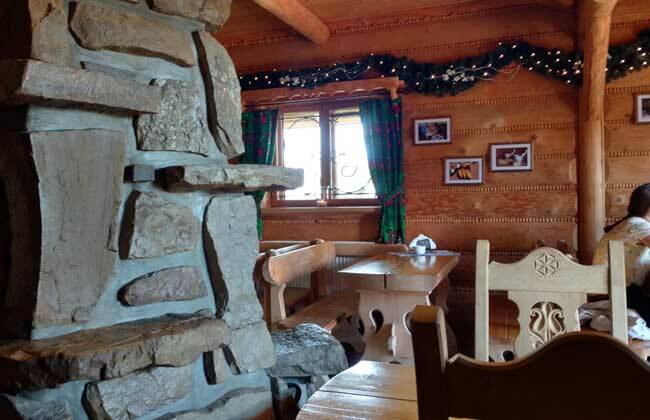 When we exited the cozy wooden restaurant, we found the other two couples assembled there. At a small wooden smokehouse, we sampled some oscypek (sheep’s cheese), salty, smooth, and delicious. Then, we enjoyed a scenic cable car ride to Mount Gubalowka. 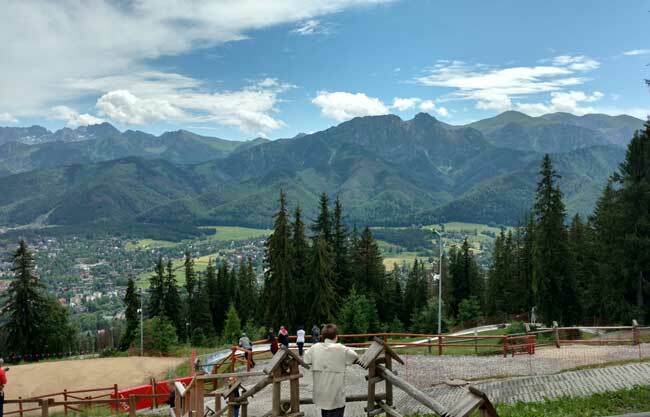 Both from the mountain, and from the upper section of Zakopane, the views of the Tatra Mountains, bordering Poland and Slovakia, were breathtaking. For hikers and backpackers, Zakopane and the Tatra Mountains offer many moderate to difficult trails to explore. We didn’t have time during this visit for a proper hike, although we did a lot of walking as we enjoyed the view. 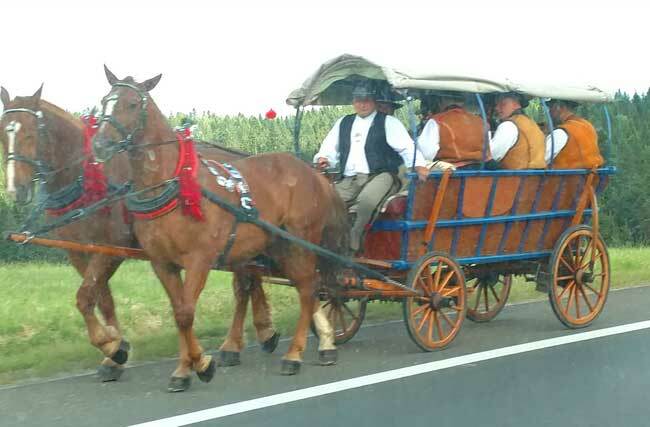 As we rode home, passing horse-drawn carriages much like the ones seen in Amish areas in Pennsylvania and Ohio, it seemed hard to imagine that the world was becoming more divided. 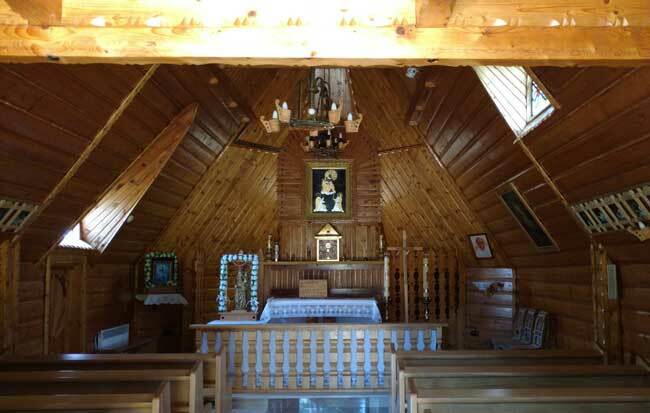 Here in the bus, with the driver and guide included, we had couples representing Poland, Scotland, England, Jordan, and America, all enjoying an excursion together along the Polish countryside. Everyone got along just fine, like normal adults. Some politicians may divide, but regular people, put face to face, seem to easily and eagerly work together to enjoy common ground. There are a number of ways to get from Krakow to Zakopane, the most popular and efficient being the bus or train. However, it’s worth paying a little more, if your time is limited and you’re only spending a day, to hire a driver or go with a tour company for a day-tour. Many companies offer day-tours that include transportation, stops along the way at interesting sights, lunch, a cable-car ride to the mountains, museum admission, and a guided tour of popular sights, all for around $100 per person. The conversations—political or not—come at no extra charge and are part of the fun! 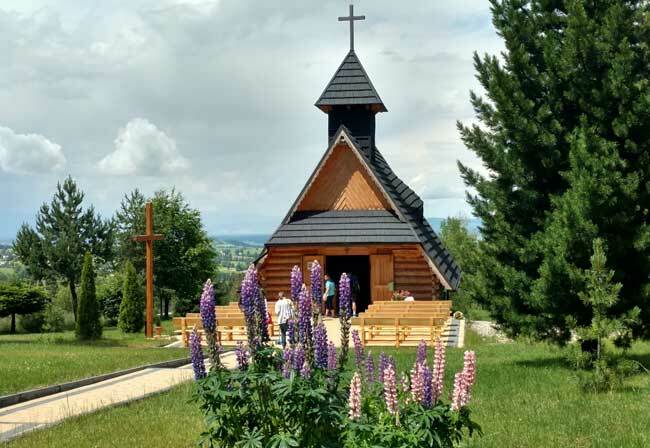 You can book such tours before you go to Poland at such places as Trip Advisor, Viator, your travel agent, or the service you use to book your flights and/or hotels. A day trip from Krakow is well worth it; if you have time to spare, an overnight would be even better.